Cheesecakes are one of the oldest desserts in existence, traceable back to ancient Greece, where they were served to the Olympic athletes. And it's no wonder they have been around so long! 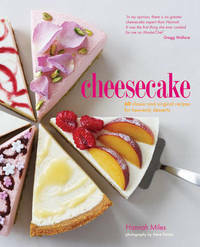 Simple to make and undeniably irresistible, Cheesecake celebrates this most beloved of desserts. A chapter on the Classics includes simple Baked Vanilla, Raspberry Ripple and Chocolate Chip cheesecakes. Whatever the time of year, Fruity cheesecakes are the best way to enjoy whatever is in season; try Strawberry and Clotted Cream, Pink Rhubarb or Bananas Foster. For those with the most incurable of sweet tooths, Candy Bar cheesecakes are packed with your favourite confections - from peanut brittle to candied maple pecans - while Gourmet recipes add a touch of contemporary sophistication, including Salted Honey and Creme Brulee varieties. Party cheesecakes offer truly original ideas for brightening any occasion, from pretty Trifle Cheesecakes in glass jars to irresistible Cheesecake Pops! And finally, International skips over the globe to bring you cheesecakes in flavours such as Japanese Cherry Blossom and Italian Tiramisu. A lawyer and MasterChef finalist, Hannah Miles has developed a second career as a cake maker and food writer. She is the author of Whoopie Pies, The Gluten-free Baker, Popcorn Treats, Milkshake Bar and Doughnuts, all published by RPS. Hannah lives in Bedfordshire.